Update: A Netflix representative has told us that if you're watching Netflix on a 1080p TV that supports HDR, the content will display in HDR. The Netflix stream will come to your TV at 1080p HDR, the rep said. This means it's not just PS4s that get the benefit of lower-res HDR content, after all. HDR, the new technology that makes a television’s whites brighter and blacks, has quickly become a must-have feature for new 4K TVs. 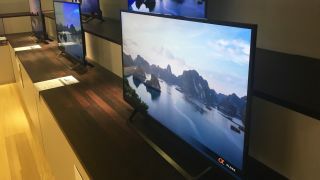 But yesterday Sony took the unusual step of bringing the technology to its entire lineup of Full HD 1080p screens, from the budget Bravia RE4 through to the mid-range WE6 and the more premium (but still just 1080p) WE75. It’s an interesting move, as until now HDR has been mostly limited to Ultra HD 4K sets. In fact, the only non-4K HDR content we’re aware of comes from Sony’s own PS4 console, which received HDR functionality for its games via a firmware update late last year. We've also sought clarification from Microsoft about whether the Xbox One S is able to output an HDR signal at 1080p resolutions. If you’ve been struggling to find a Full HD set to make use of your PS4’s HDR functionality, then the new Sony models might be the ones to go with. But if you’re not a PS4 owner, or if you're a PS4 owner that mainly uses the console for media viewing rather than gaming, then you’ll have a hard time finding any HDR content to watch at 1080p and it’s much tougher to justify paying a premium for the feature.